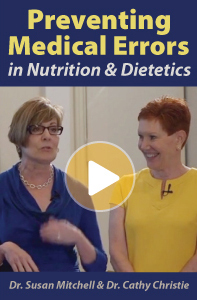 Preventing Medical Errors in Nutrition & Dietetics is a 2-hour video continuing education (CE/CEU) course recorded at the Annual Symposium of the Florida Academy of Nutrition and Dietetics in July 2014. 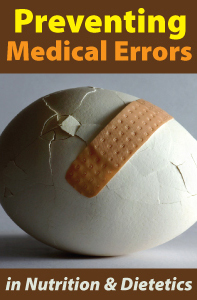 It addresses the impact of medical errors on today’s healthcare with a focus on root cause analysis, error reduction and prevention, and patient safety in the practice of nutrition and dietetics. Real life stories, national healthcare safety trends, reporting of sentinel events, complying with HIPAA privacy and security rules, telehealth practices, and caring communication techniques are addressed. Printable hand-outs, a glossary and online resources are provided. This course satisfies the requirements of the Florida State Legislature mandating a 2-hour medical errors course for health professionals.